OUR NEW MSI AGENT INSTALLER IS RELEASED! Automation is about making your life easier, right? Say hello to easier installs, both manually and via the RMM, thanks to the new MSI Agent Installer! Check out the video below or register for next week's Roar Report Webinar to learn more! The inspections and the app should be faster now! We made a change to our infrastructure that allows us to scale more reliably and process much higher volumes of data concurrently. Sonicwall now includes full "show tech-support-report" in the dataprint under the "Raw" field. This is to assist with rebuilding a firewall if needed in case of device failure. 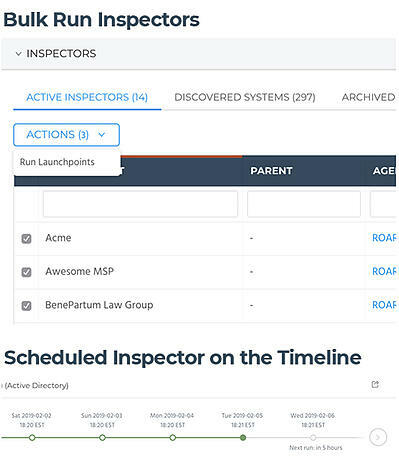 You can now run multiple inspectors at a time instead of having to click "Run" for each one individually. Additionally, we now show on the timeline when the inspector is scheduled to run next (and we show a warning if it's not scheduled to run again). We will be at XChange & Robin Robins in March, let us know if you are going! We're rolling out Roar's initial integration with Autotask in the next few weeks.